I’ve never been a huge lover of steak – I often say I find it boring, and that I’d rather have the meat in a casserole or something. But occasionally I get tempted, and I think there is elegance and skill in the simplicity of it; making the flavour of the meat stand out with only a little seasoning, a small bit of sauce and careful timing during the cooking process. I used a rump steak as I like nice thick slices, but feel free to use any cut. Also before you throw things, I only sliced it pre-serving so that the rareness was apparent. I wouldn’t recommend doing this for anybody but yourself, as you risk letting the meat cool down too much. But I’ll be honest, in the 2 years or so I’ve been doing this, few meals have been hot by the time I get to eat them, what with taking the photos and all. I’ve grown used to it. Set a frying pan above a high heat and allow it to get very hot for a couple of minutes. While you do this, rub your steak with oil and seasoning. 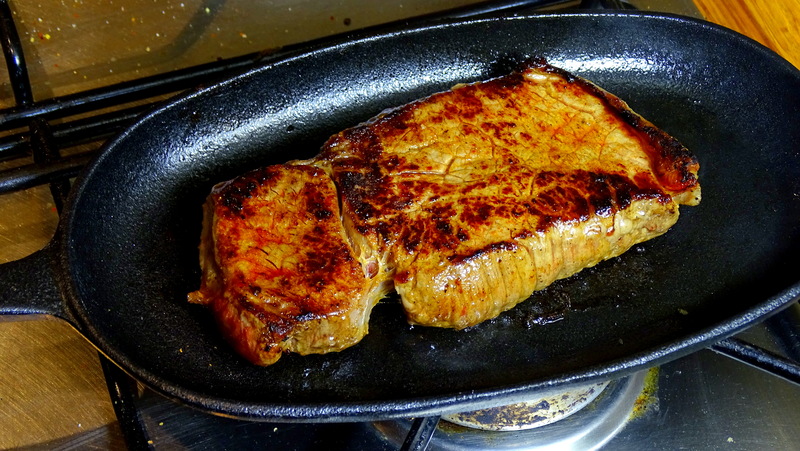 Place the steak into the pan dry and fry a minute on each side. I can’t offer full guidance on cooking times as it depends the cut. For this rump, I did an additional 2 minutes on each side to get rare. If you’re unsure, use the finger-thumb technique. Remove the steak to a warm plate to rest for a few minutes. 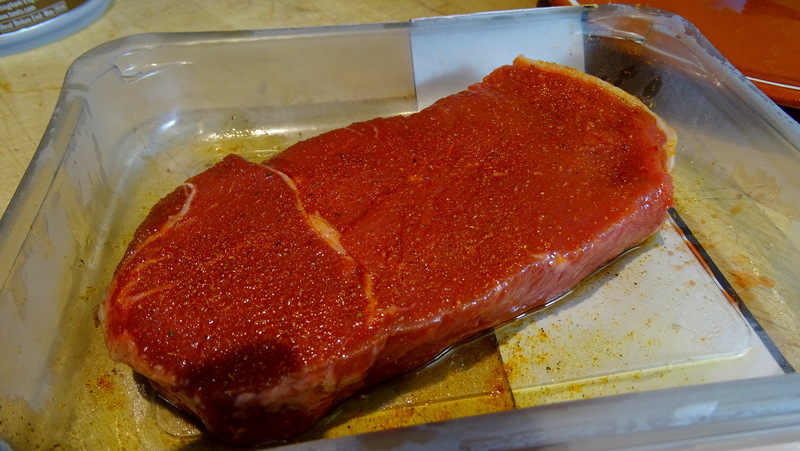 Do not skip this step – it’s vital to ensure you have a properly cooked, moist steak. 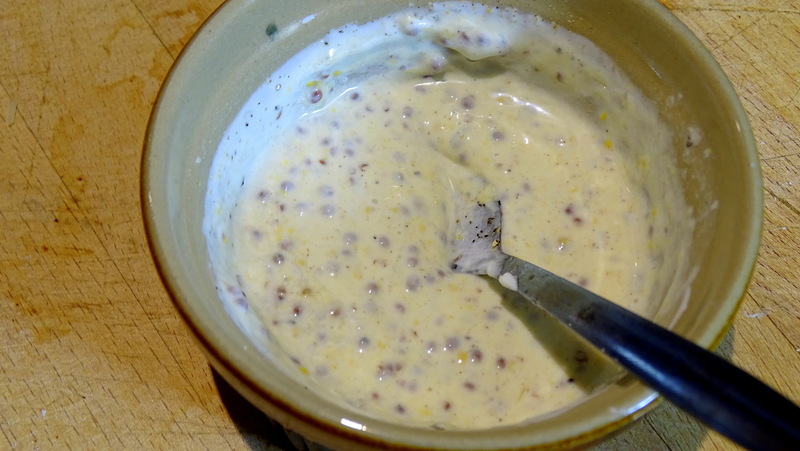 In a small bowl combine the creme fraiche and mustard at a ratio of around 3:1, with a sprinkling of sugar/sweetener and an optional splash of wine/water. 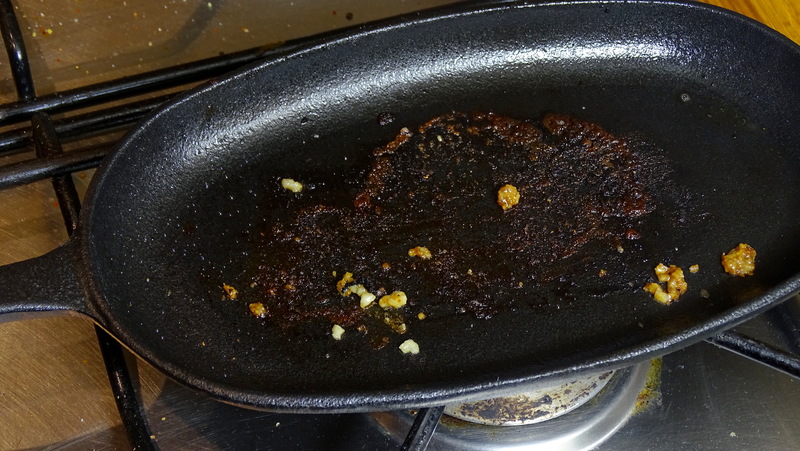 Remove the pan from the heat and add a tiny bit of crushed garlic, frying for a minute or so. 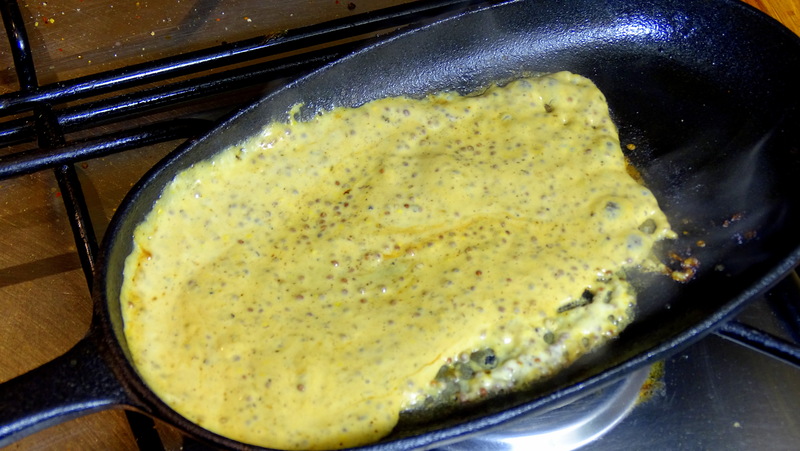 Add the mustard mixture to the pan and stir into the fond left by the steak and cook for a further minute or so. 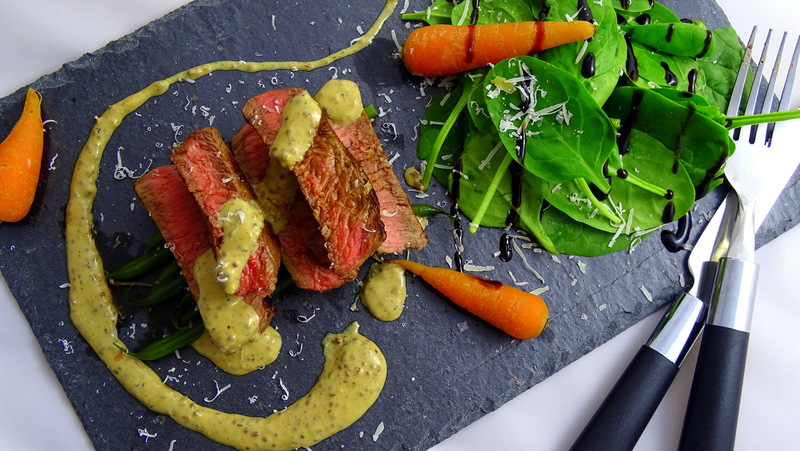 Serve with steamed vegetables and a sprinkling of large crystal salt. Posted in Beef, Guesscipes, Mains, One PotTagged beef, food, gourmet, guesscipe, main, rare, recipe, sauce, steakBookmark the permalink.